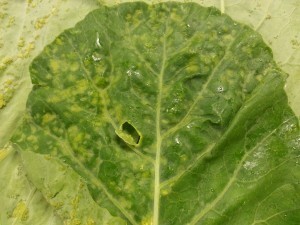 Edema is being reported in some brassica crops. Edema is often expressed as off-color swellings or galls that appear on leaves and stems. Edema develops when epidermal cells hold excessive water due to a slowing of evapotransporation when hot, muggy days are followed cooler, wetter weather. Edema develops because the plant takes in more water (due to a high soil moisture contant) than it can get rid of causing cells to rupture which results in the blistering of the leaves. Note the off-color appearance of leaf surface. 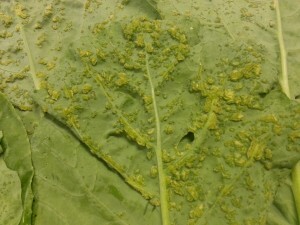 Edema, bottom side of collard leaf.